For this study, the researchers put satellite collars on a relatively small sample of adult female polar bears between 1991-1997 and 2004-2009 (none in 1998-2004) to see when they came ashore in summer and when they went back out on the ice in the fall. They tested models to see what concentration of sea ice best predicted when polar bears came ashore and when they left. 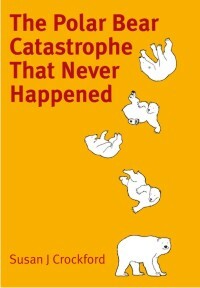 No wonder only polar bear biologists calculate breakup dates. Figure 2. This is figure 2 from Cherry et al (2013, in press). 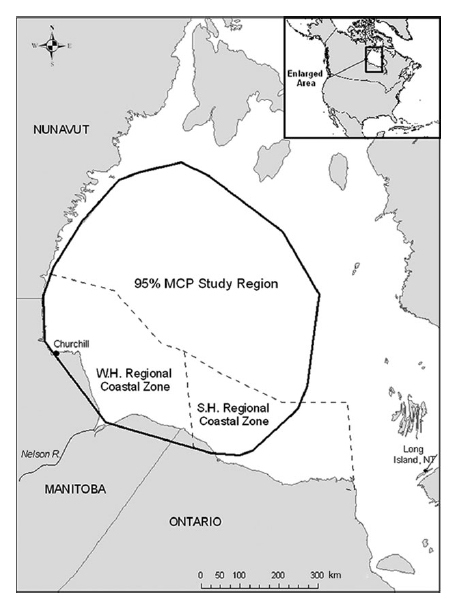 The original caption reads: “Dates of sea ice concentrations that best corresponded to dates ashore during break-up and departure from shore dates during freeze-up for collared polar bears in western Hudson Bay. Dates ashore and departure from shore dates are shown as annual means for all collared polar bears.” Note that the bottom line shows breakup dates (open triangles) and the line above it (filled triangles), the date collared polar bears arrived on shore. 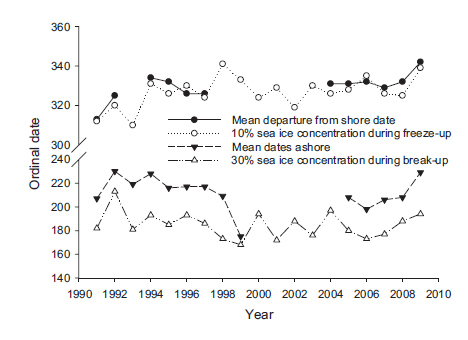 Note two things: 1) arrival on shore in 2009 appears to be as late as 1992, approximately Julian date 234; 2) there is no discernible trend in breakup dates over the 19 years of the study. 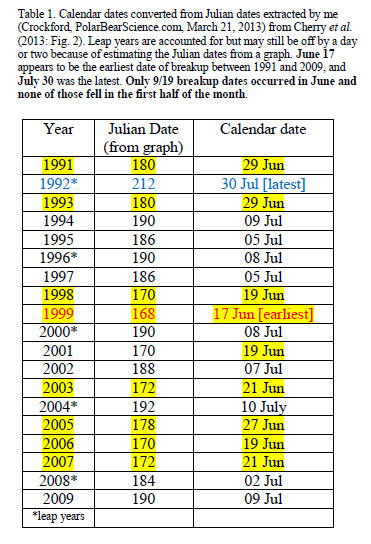 When I calculated the breakup dates, shown in the table below, leap years were accounted for but the dates may still be off by a day or two because of having to read the Julian dates off a graph. However, as you can see, June 17 appears to be the earliest date of breakup between 1991 and 2009, and July 30 was the latest. Only 8 9 out of 19 breakup dates occurred in June and none of those fell in the first half of the month. So, the data show that polar bears do not leave the ice until almost a month after the breakup date (average 28.3 days). So, for the earliest breakup date recorded (17 June), the polar bears they studied did not start their summer fast until the middle of July. But in 2009, as the graph (Fig. 2) shows, the bears stayed on the ice about two weeks longer than average and did not go ashore until the 22nd of August. Well, it seems pretty obvious to me that there is a very close relationship between when sea ice develops in the fall and when polar bears are able to use it as a hunting and traveling platform. But now they have numbers and are very proud of it. And why do they need numbers? For the models, of course – models don’t work without numbers! 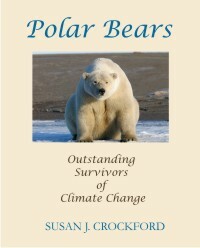 Ultimately, the whole point of the study (for them) seems to be that it gives them the ability to make “better” crystal-ball predictions about how much danger polar bears could be exposed to, some time in the future, because of global warming. However, we don’t have to accept the conclusions the authors make about what is important about their study – we have the data they generated. The data confirm that there has not been any kind of spectacular retreat of sea ice breakup dates – coming earlier and earlier in the season – over the last 19 years. 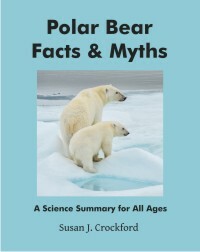 It also confirms that polar bears did not arrive on shore in 2009 until very late in the season – approximately 22 August – the same date they came ashore in 1992. The massive June 1991 eruption of Mount Pinatubo, is said to have caused extra cold conditions in the Arctic the winter of 1991-1992 (Chambellant et al. 2012) – but what caused the cold of 2009? Could it have been natural variation? This entry was posted in Sea ice habitat and tagged Derocher, habitat, Hudson Bay breakup, Hudson Bay freeze-up, Lunn, Mount Pinatubo eruption, sea ice extent, sea ice models, Seth Cherry, summer ice minimum. Bookmark the permalink.